6.2 Earthquake hits eastern Honshu, Japan. The earthquake injured at least 39 people while more than 43 houses in a popular ski-resort collapsed. 5.8 Earthquake hits central Afghanistan. 5.4 Earthquake hits off the coast of Oregon, USA. 5.0 Earthquake hits off the coast of Oregon, USA. A 13-year pause in the overall warming of the world’s ocean surface ended earlier this year with the average global mean sea surface temperature soaring to the warmest ever recorded. “The 2014 global ocean warming is mostly due to the North Pacific, which has warmed far beyond any recorded value and has shifted hurricane tracks, weakened trade winds and produced coral bleaching in the Hawaiian Islands,” said climate scientist Axel Timmermann of the University of Hawaii at Manoa. He says sea-surface temperatures started to rise quickly in January across the North Pacific, followed by a surge of very warm water from the western Pacific to the eastern Pacific along the equator. 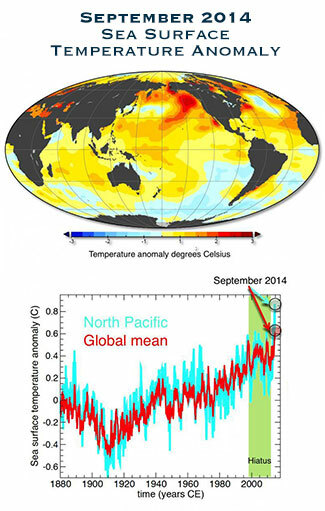 “Record-breaking greenhouse gas concentrations and anomalously weak North Pacific summer trade winds, which usually cool the ocean surface, have contributed further to the rise in sea surface temperatures,” says Timmermann. “The warm temperatures now extend in a wide swath from just north of Papua New Guinea to the Gulf of Alaska,” he adds. Fogo (Cape Verde): A new eruption started at the volcano this morning around 10:00 local time. The aviation alert was raised to red due to possible ash emissions that could harm aircraft in the area. Not much detail about the eruption is so far available, but a strong thermal anomaly was detected on satellite data, suggesting the presence of lava at the vent, perhaps in the form of lava fountains. Typical eruptions of Fogo start with lava fountains / strombolian activity that build a new cone, followed by lava flow effusion.